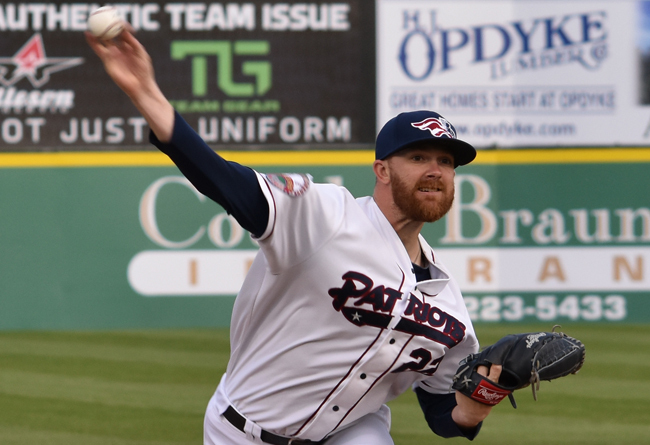 (Bridgewater, N.J., April 9, 2019) - The Somerset Patriots today announced that four-year Major Leaguer and former Patriot right-handed pitcher Tyler Cloyd has been signed for the 2019 season. Cloyd enters his second season with the Somerset Patriots and second in the Atlantic League. The 6’3” righty enjoyed a brief stint with the club in 2017, when he owned a 1.50 ERA over three starts for Somerset. Cloyd also struck out 16 batters over just 12 innings of work before his contract was purchased by the Seattle Mariners. He was later promoted from Triple-A Tacoma to Seattle just 27 days after his last performance as a Patriot, becoming the 18th player in franchise history to record service at the Major League level after donning a Somerset uniform. The Papillon, Nebraska native first broke into the majors in 2012 with the Philadelphia Phillies. A former 18th round pick of the team in the 2008 Amateur Draft, Cloyd earned four wins with 71 strikeouts over 19 games (17 starts) over two seasons in the big leagues with Philadelphia. After getting back to “The Show” with the Mariners in 2017, he signed with the Miami Marlins as a free agent for the 2018 season, eventually getting back to the majors to strike out 13 batters over 17.2 innings in seven relief appearances. Cloyd signed a minor league contract with the New York Yankees in 2016, a year prior to joining the Patriots. There, he posted a 1.37 ERA over four games before his season was cut short due to injury. The University of Nebraska at Omaha alumnus spent the first six seasons of his professional career in the Phillies system before pitching with Triple-A Columbus in the Cleveland Indians organization in 2014. Cloyd’s best season as a pro came in 2012 with Triple-A Lehigh Valley. That year, he went 12-1 and led the International League in ERA (2.35). He was named an International League Mid-Season and Post-Season All-Star that year, along with MiLB.com Organizational All-Star and the league’s Most Valuable Pitcher honors. Topps also named Cloyd a 2012 Triple-A All-Star and the International League Player of the Year. Cloyd most recently spent Spring Training this year in the Tampa Bay Rays camp. He has commanded an 88-70 record with a 4.13 ERA, seven complete games and three total shutouts over 288 games (226 starts) in his 11-year professional career.